V. How great the Savior’s goodness is! This piece appears first in the Riesenkodex manuscript, and is one of the five pieces addressed to God that are not included in the Dendermonde manuscript. Though initially addressed to God the Father, the central theme is the Son’s Incarnation, as the piece reflects on one of Hildegard’s most characteristic themes: the fulfillment of the “eternal counsel” (Ps. 32:11), that is, the predestined movement from creation through the Word to recreation by the Word-made-flesh. An often minority position in western Christianity, this doctrine of the eternal predestination of Christ holds that the Incarnation was a part of the divine counsel (“held in order in your heart”) for creation from before all ages, rather than simply a “back-up plan” to fix the Fall. In this sense, the entire course of salvation history is the performance in time of the timeless celestial symphony, composed in eternity by the resounding Word of God (cf. O quam mirabilis est and O splendidissima gemma). For Hildegard, the Incarnation is the pivotal moment in which creation reached its perfect and predestined trajectory. The pairing of Adam—the first human, whose Fall broke that creation—and Christ—the God-human, whose Incarnation restored it—is commonplace in Christian thought, rooted in the writings of St. Paul (e.g. Romans 5:12-21 and 1 Corinthians 15:21-50). In this responsory, Hildegard exploits the repetition of the repetendum (refrain) to elegantly move from thinking first about the cleansing of Adam’s flesh from the suffering of sin to the cleansing of Christ’s flesh by his own suffering. As Barbara Newman notes, this transposition also involves the shift from Eve (the “form of flesh from Adam born [lit. brought forth]”) to Mary, the human form in which Christ put on flesh; and the shift from the second-person address to God, “the strength within eternity”, to a third-person narration of redemption (Symphonia, pp. 267-8). For Hildegard, the pairing of Adam-Christ necessarily involves the complementary pairing of Eve-Mary; and the latter parallel forms the basis for that narrative of redemption in many of her musical pieces addressed to the Virgin (cf. especially Ave Maria, O auctrix vite and O clarissima, and her revision of 1 Corinthians 15 in Quia ergo femina). Musically, the significance of the Incarnation is highlighted by strategic placement of a repeated melodic gesture that encompasses the highest pitch, G an octave and a third above the final. This melody appears on: ordinasti, per Verbum tuum, sicut voluisti, induit carnem, a maximo dolore, abstersa, and quam divinitas exspiravit. Hildegard thus links the key ideas and themes—God’s actions, the Word, the Word’s assumption of flesh, and the sorrow caused by the fall and then redeemed by the Word’s own suffering. An extended melisma on [abstersa] sunt in the repetendum gives an additional and repeated rhetorical import to the redemptive qualities of this cleansing. 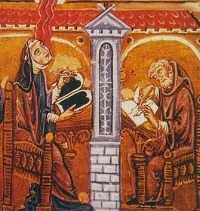 The use of musically emphatic gestures on verbs is typical of Hildegard’s style. Set in the E mode, both E and B are used as the primary tonal markers in this responsory. While E is generally the primary focal pitch in this mode, B assumes an almost equivalent status here. In general, Hildegard’s songs begin with a salutation that is outlined by the final of the mode. In this responsory, however, the pattern is different. Hildegard’s use of the tonal markers gives the effect of an extended greeting past the salutation of O vis eternitatis that comes to a cadence, if you will, on E at the conclusion of in formatione illa. O is outlined by the final, and while vis eternitatis begins on E, it ends on B. The next phrase begins with que (“which,” referring to vis as God) on A, which serves as both a musical and textual conjunction to segue into God’s actions. Though que ends on B, it could technically complete the second line (vis eternitatis), but doing so would violate the lyrical syntax. The use of B as the primary outlining or ending tone in this first section creates a musical suspension or tension of sorts that serves to hold the listener’s attention until the more final conclusion on E on in formatione illa. Another musical tension exists in the phrase that immediately follows, to end the first versicle (the last line of page one and the first line of page two in the transcription). The words, de Adam, are set to a musical gesture—the leap and rise to high pitch E, an octave above the final—that might more properly open a phrase, rather than concluding the first versicle. While a figure such as this is found in the middle of a line in some of the more complex, melismatically set songs, here, it just doesn’t fit. To combine in formatione illa with que educta est and to make de Adam its own phrase is musically more satisfying, but not entirely, as the musical phrase on in formatione illa is complete in itself. As with the opening, Hildegard sets que (in que educta est) to a conjunctive tone, in this case D. Here, singers have more choice for phrasing options than with the opening. Whatever option is selected, some emphasis should probably be placed on de Adam. Thematically, this emphasis propels the piece from versicle to first respond, which echoes it with a variation that peaks at the piece’s highest note on a maxima dolore—the sorrow introduced by Adam’s sin, then shared in the thematic shift in the second respond by Christ’s own suffering humanity. Barline ticks have been placed to show phrase endings that are not entirely clear. The most significant one is found in the respond on page two, lines 4 and 5, where abstersa sunt is a single phrase broken up in the transcription in the interest of not crowding the line. —Commentary and Notes by Nathaniel M. Campbell and Beverly Lomer. Hildegard of Bingen, Symphonia, ed. Barbara Newman (Cornell Univ. Press, 1987 / 1997), pp. 98 and 267-8.